Inspiring Creative Entrepreneurs or ‘ICE’, a retail outlet in Edinburgh’s St James Shopping Centre now stocks ES products. Full of interesting and original gift ideas, creative works of art and one off pieces which must be seen. 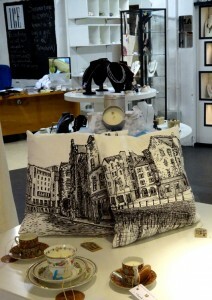 And now home to a number of EdinburghSketcher prints, cushions and more. An Edinburgh based company set up to bring together work of the talented creative people of Scotland from the arenas of art, fashion, jewellery ICE is a treasure trove of not-seen-before treats. Claire Yetton liked this on Facebook. Greater Grassmarket liked this on Facebook. Paddy Lynch liked this on Facebook. Marie Varley liked this on Facebook. Kirsty Matheson liked this on Facebook. Bleu Hope liked this on Facebook. Renate Wolf liked this on Facebook. Molly Mary Ahearn liked this on Facebook. Gillian McMurray liked this on Facebook. Julie Morris liked this on Facebook. Dawn Lynch liked this on Facebook. Nancy Anne Bassford Yannayon liked this on Facebook. Hula Juice Bar liked this on Facebook. Margaret Eveleigh liked this on Facebook. Rudolph Tammes liked this on Facebook.